There are other more serious causes of flashes and floaters, however. Retinal tears, retinal detachment, infection, inflammation, haemorrhage, or an injury such as a blow to the head may also cause floaters and flashes. (Have you ever seen stars after bumping your head?) Occasionally, flashes of light are caused by neurological problems such as a migraine headache. When related to a headache, the flashes of light are seen in both eyes and usually lasts 20-30 minutes before the headache starts. 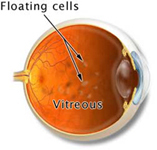 Because of the risk, surgery is rarely indicated for PVD except when the floaters obscure the vision.In these cases, surgical removal of the vitreous (vitrectomy) may be considered only if the vision is significantly affected.This treatment is rarely needed since floaters typically become less bothersome over a period of weeks to months as they settle below the line of sight.